I found myself headed outside to play winter league softball (also known as “whiskey league” by my team aptly named “Beer Me”). Can you guess where I am in that picture? No, not the softball game. I didn’t wear my ski jacket to tonight’s softball game. It’s a Steelers hat that I knitted myself! 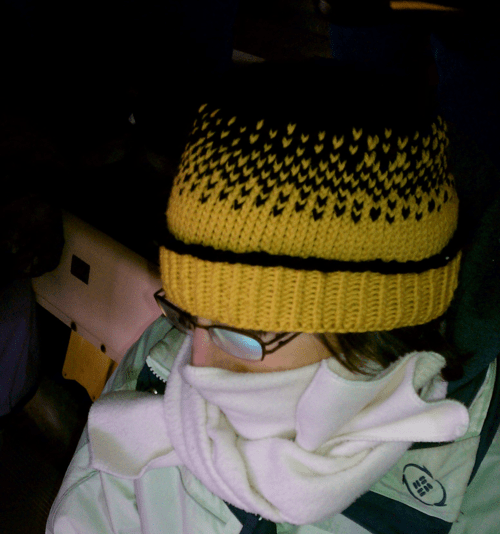 I was at the Steelers – Panthers game in Pittsburgh on December 23rd. It was REALLY COLD there. I really like how that hat turned out. You can get the pattern on Ravelry (login needed). The yarn was very warm and knit up nicely (Knit Picks Swish Worsted). As the pattern was written it was too big for me and I had to do only 3” of stockinette stitch after the ribbing. You know, just in case you want to knit this hat too. ← Yesterday I made a dog bed cover.Instructions:Measure dog.